My honeymoon period for reviewing games just ended. After two short games, one great and the other average, I now know the horror of slogging through a soulless role-playing game. While constantly longing to play other games like Breath of the Wild or Persona 5, I had to slave away at Akiba's Beat the last couple of weeks. Successor to Akiba's Trip, but officially unrelated, Akiba's Beat is shallow due to an obviously tight budget and lack of self-identity. Gone are the elements of stripping, dressing up, fighting in the streets, romancing, advanced techniques, and even weapons. Akiba's Beat is basically Akiba's Trip with all the things that made the previous game addicting replaced with blander alternatives. It also kept the bland bits of Trip, unfortunately. As the name implies, Akiba's Beat takes place in Tokyo, Japan's Akihabara (Akiba for short), a mecca of otaku culture including anime, manga, video games, idols, maids, and electronics. Recreating Akihabara as genuinely as possible has been a selling point for the series, but this is the worst version of it. 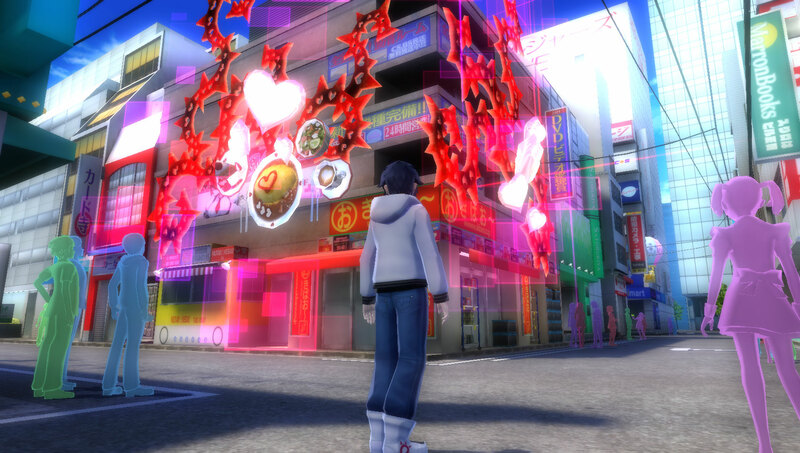 The things you can interact with in this game's Akiba are scarce. Having narrow areas to move in with many invisible walls is nothing new, but there are fewer areas than in Undead and Undressed. The bigger issue, however, is the lack of people and interaction therewith. Instead of entering stores and seeing a unique shop owner, you just open a lifeless menu. Instead of NPCs walking about, waiting to run or fight at your provocation, here they are replaced with inanimate silhouettes. Rarely, you'll see one of these colored ghosts shaking his hand, but the vast majority of them are completely frozen and faceless. When you run by them they will utter a single line of dialogue, but they are wholly non-interactable: you cannot engage in conversation nor fisticuffs with them. In fact, you do not participate in dialogue at all. Even in the main story and sub-events, there is no dialogue nor any sort of romance options. Not that a game must have romance, but people tend to expect it in titles like this, especially when the main story and characters are uninteresting. There are optional sub-events where you follow a quest-line with both main and ancillary characters. These sub-events are divided into chapters per character (eight for party members, three for side-characters) that unlock as the game progresses. In these sub-events you learn more about the characters and develop platonic bonds with them, but without any dialogue options, it feels tedious. The character writing isn't awful, but it's not exactly Persona. Even the designs are for the most part sub-par. With an attentive eye, one can see that, yes, these characters are given certain traits no more cliché than other titles and they complete arcs. However, they just don't stitch together to form any sort of emotional connection. Thanks to dual-audio, we don't have to suffer through the English voice acting. Still, I'm not a fan of the liberties taken with the translation. Often times fluff -- typically obnoxious memes or lame jokes -- is added where no such Japanese was used. Where the character may just say something like "I like anime" in Japanese, the translation might be "Yo I'm da anime king boi, I got tons of DVDs. DVDS FOR DAYS!" The translation is error-free, but the extra flavoring is distasteful. Sorry, XSEED. 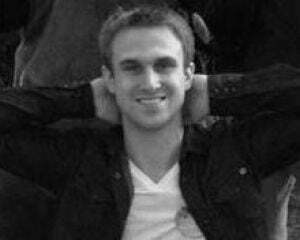 The story's premise revolves around people who have unattainable dreams that become delusions and manifest. Those people become stuck in their delusion as the same Sunday repeats over and over. Similar to how you help characters overcome their shadows in Persona 4, Asahi and the gang help people with their delusions. Though rather than having a focused moment of coming to terms with reality to overcome the delusion, you just beat up some monsters and literally kill it. This premise and the overall story are slightly better than that of Akiba's Trip: Undead and Undressed, but the interesting angle of delusions isn't explored enough. Worse yet, scenes seem to drag on forever without much being said. Stripping vampires in the streets is so ridiculous it's easy to forgive the overall weak story. 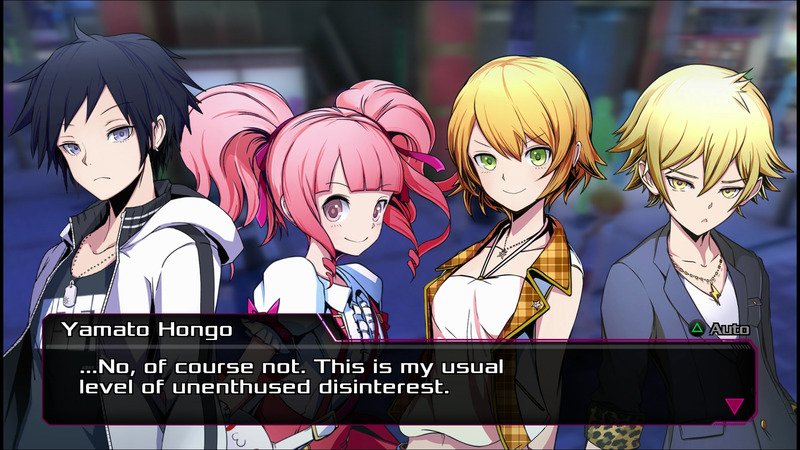 Akiba's Beat plays it a little too straight-faced, too safe. Ultimately, the story isn't intriguing on its own, but where Akiba's Trip had fun gameplay to make up for its lackluster tale, Akiba's Beat complements the bland story with bland play. The phrase "game feel" makes me shudder with its vagueness, but if someone said Akiba's Beat had "bad game feel," I would understand. Everything feels stilted, stiff, and slow. You can walk or run, but nothing in between. The jump is at a set hang-time, with no ability to control its height. You can't make it over small objects due to invisible walls. NPC dialogue locks to the side of the screen where it is quite hard to read in the half-second it's there. Of course Pinkun, the little mascot bear thing, is this game's Navi, constantly repeating the same things whenever you pass something. He can be replaced by a maid early on, but they'll all ask you to save every time you're within 10 feet of a save point (incidentally where you spawn when you fast travel, if you ever need to in this small map). Even minor things like the map -- which cannot be zoomed in or out -- are tedious. Combat doesn't feel much better. 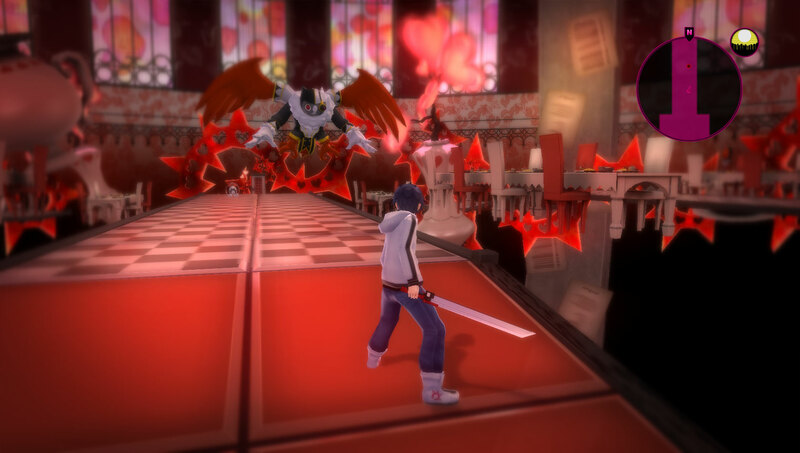 Unlike Akiba's Trip where you fought people on the Akiba streets actively, Akiba's Beat sends you through Persona-like dungeon areas with uninspired monsters in separate battle zones. Attacking either on the field to get an advantage or in battle feels slow and inhibiting; you're locked into the animation and the couple-second paralysis your controlled character suffers afterwards once you attack. But fear not, for mashing square (standard attack) and sometimes X (skill) until your foe is dead is about all you can do. There's a special "Imagine" mode you can activate, but not much changes: you're still just spamming square like Kratos. The themed delusionscapes are interesting, but it just feels like every other JRPG, especially Persona. This game is not meant to be Akiba's Strip, but it could have learned something from Strip's originality and "I don't care what anyone thinks, this is what I'm doing" attitude. I don't understand why'd they stop something unique to make such a cookie-cutter RPG. Perhaps some were put off by the sexual themes. Is something dull yet safe really the better alternative? No. A game made for everyone is a game made for no one. 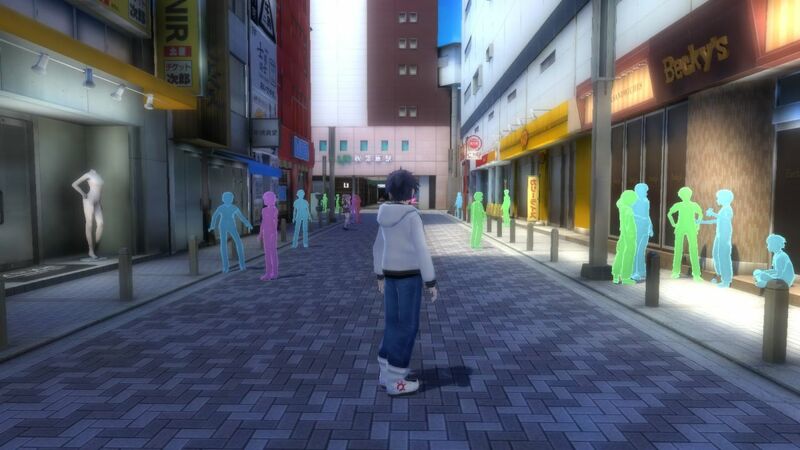 Likely due to the budget, there's just not many things to do in Akiba's Beat. There are no weapons, no poses or walking animations, no camera, no mini-games, no dialogue options or romance. There is armor in the form of clothing, but there isn't any cosmetic change (only in DLC), and every store of a certain type (clothing, items, etc.) sells the same stuff. This game easily could have just been a visual novel and not change much. Every now and then there will be an enjoyable moment; a small gag that makes you grin or the moment when you step back and notice what's happening on screen -- J-pop playing and hearts flashing as idols and maids fight an Optimus Prime-looking robot while a little puffy dog cheers you on -- and you think "this is the most Japanese thing since the end of Metal Gear Solid: Peace Walker." Most of the time, however, you will be bored and looking at your phone. Even if Akiba's Beat had a higher budget and more time, it lacks any unique features, mimicking what other games do, but worse. For 40 hours you'll mash X through slow dialogue, then run around a dead environment, and then do more dialogue until you get to mash square against sponges. If Akiba's Trip is the shirtless jock who kicks the door in with beers in hand, Akiba's Beat is the timid cocktail-drinker standing in the corner with one hand in his pocket. Technically functional, but spiritually dead.